Encircling Delos, sacred birthplace of Apollo, the Cyclades are archetypal Greek isles where sugar-cube villages and ancient ruins mingle with sunbaked beaches, meandering hiking trails, and spectacular views of Homer’s wine-dark sea—not to mention some of the best nightlife in the Aegean. From the well-trodden shores of Santorini and Mykonos to quieter escapes like Folegandros, read on to discover the best of six of the Cyclades. Unabashedly commercial, Santorini is one of Europe’s most popular honeymoon destinations as well as major port of call for cruise ships sailing to the Mediterranean. A five-hour ferry ride southeast from Athens’ port, Piraeus, gets you to the villages of Fira and Oia with their whitewashed cubic houses and blue-domed churches perched atop red-and-black cliffs that plummet some 300 meters into Santorini’s famous caldera, a flooded crater created by a massive volcanic eruption more than 3,500 years ago. You also get pristine black-sand beaches, the Aegean’s finest winemakers, gourmet restaurants, chic boutique hotels, and sublime orangey-mauve sunsets. 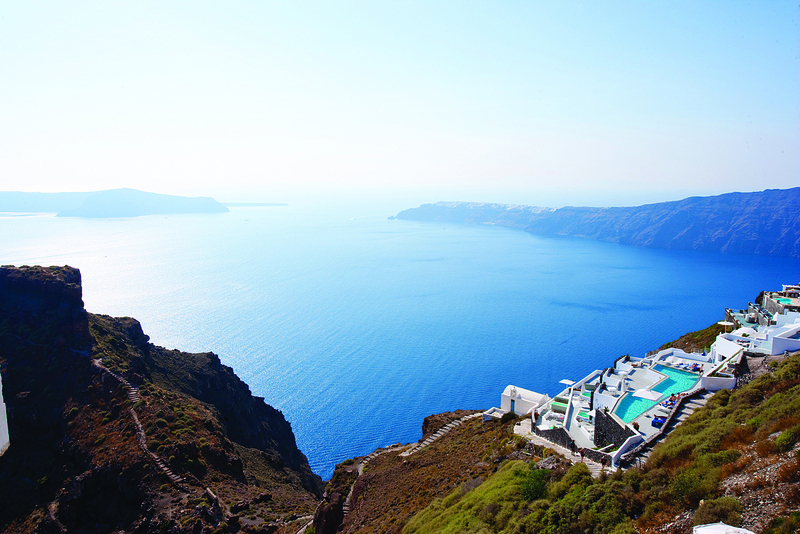 Where to Stay: In the cliff-top village of Imerovigli, overlooking the caldera, Grace Santorini (30-22/8602-1300; santorinigrace.com; doubles from US$478) offers just 21 minimalist white-on-white rooms and suites, some with a private terrace and plunge pool. Meal Not to Miss: Traditional dishes with a modern twist, such as shrimp in ouzo and fennel, at Metaxi Mas (30-22/8603-1323; santorini-meta ximas.gr) in the sleepy inland village of Exo Gonia. Be Sure To: Visit the ancient Minoan settlement of Akrotíri, a labyrinth of buildings preserved below lava for a millennia. Known as the “Pompeii of the Aegean,” the Bronze Age site reopened in the spring of 2012 after being closed for seven years. Frescoes and other finds excavated from Akrotíri are on display at Fira’s Museum of Prehistoric Thira. Glamour and hedonism abound on Mykonos, a four-hour ferry ride or two-hour catamaran ride from Rafina, just north of Athens. Greece’s answer to Ibiza is an island of golden-sand beaches, late-night clubbing, and celebrity spotting. In Mykonos Town, long hot summer nights begin with sundowners overlooking the harbor in Little Venice—try Caprice (30-22/890-23541; caprice.gr) for exquisite mojitos. 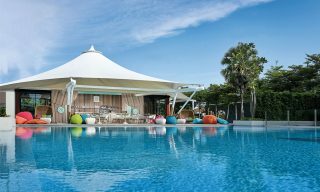 After dinner, a party vibe sets in, with bars playing up-beat dance music and hosting cabarets and drag shows. 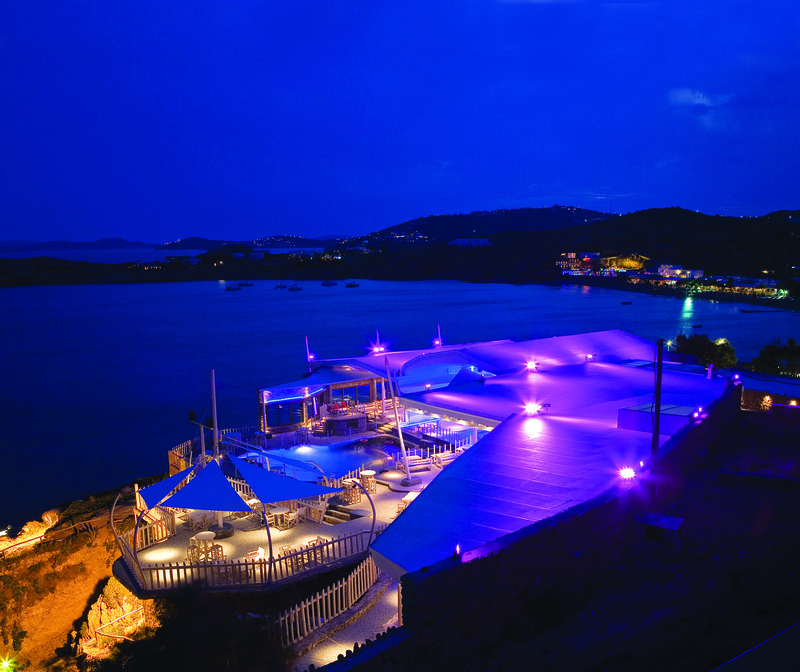 Then it’s down the south coast to Paradise Club (30-69/4079-4879; paradiseclubmykonos.com), which regularly hosts guest DJs such as Erick Morillo and Roger Sanchez, followed by after-hours Cavo Paradiso (30-22/8902-6124; cavoparadiso.gr) to watch the sun rise over the Aegean. 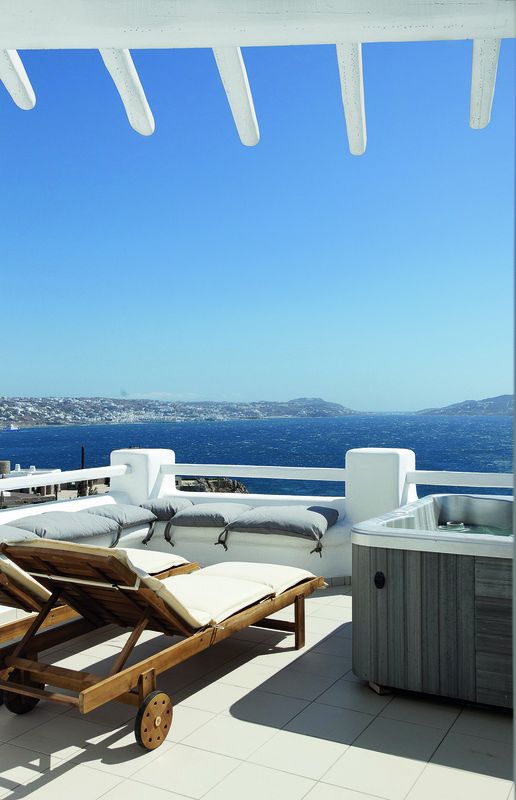 Where to Stay: At the Rocabella Mykonos Art Hotel (30-22/8902-8930; rocabellamykonos.com; doubles from US$103) on the west coast, suites come with outdoor jacuzzis and the whole complex, including the pool, is lit by flickering candles after dark. 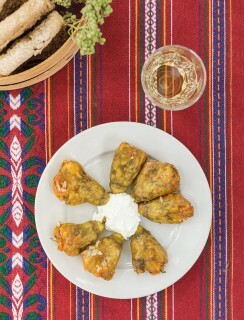 Meal Not to Miss: Dinner at Bakaló (30-22/8907-8121; bakalo.gr), a retro-chic haunt serving modern Greek taverna fare such as kolokithokeftedes (zucchini fritters) on a leafy terrace in Mykonos Town. Be Sure To: Take a boat to the rocky islet of Delos, where a World Heritage-listed archaeological site is packed with crumbling temples, marble lions, and curious fertility symbols. Nature-lovers and people looking for a relaxing Greek island experience will fall in love with Amorogos and its dramatic mountains, laid-back atmosphere, and alternative ecotourism. Although it had a starring role in The Big Blue, Luc Besson’s 1988 movie about freediving, it has remained blissfully unexploited. 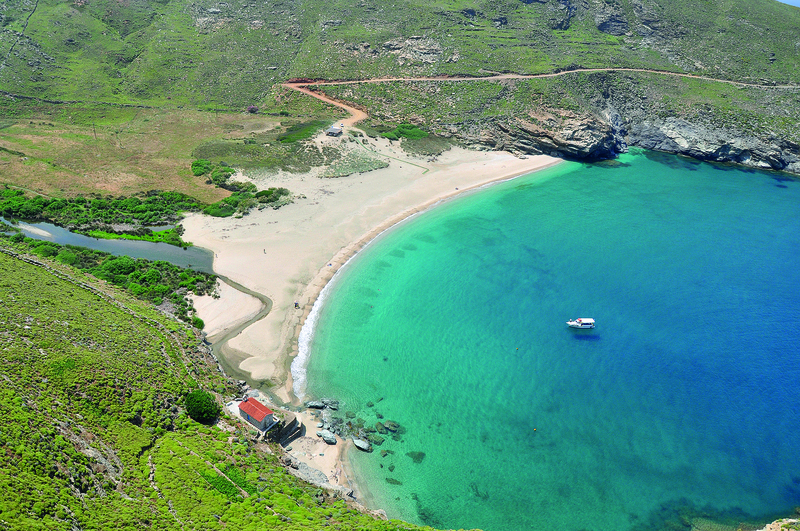 The island’s natural beauty makes up for the eight-hour ferry journey from Piraeus. Seven well-marked paths between the villages offer fantastic hiking but be prepared for steep slopes. From the lovely hilltop town of Amorgos (a.k.a. Chora, the designation shared by all island capitals), it’s a 30-minute walk to Panagia Hozoviotissa, a dazzlingly white 11th-century monastery built into a sheer cliff high above the sea. Alternatively, there is a stunning path to Aegiali that follows a mountain ridge with views down to the sea on both sides. Aegiali itself has a long sandy beach as well as the Amorgos Diving Center (30-22/8507-3611; amorgos-diving.com), which can help you explore the island’s walls and reefs. Where to Stay: In Amorgos Town, the rooms at Emprostiada Traditional Guesthouse (30-22/8507-1814; doubles from US$64) are furnished with local antiques and face a carefully tended garden. Meal Not to Miss: The tasty home cooking and barbecued meats at Taverna Panorama (30-22/8507-3349) in the village of Tholaria, above Aegiali. The restaurant’s name is misleading as there is no view at all from the terrace, but you do get occasional live music when the owner and his friends pick up their lutes and mandolins for a jam session. Be Sure To: Watch The Big Blue, screened daily at 8:30 p.m. at Le Grand Bleu Café (30-22/8507-1585; legrandbleu-amorgos.gr) in Xilokeratidhi, near Katapola. 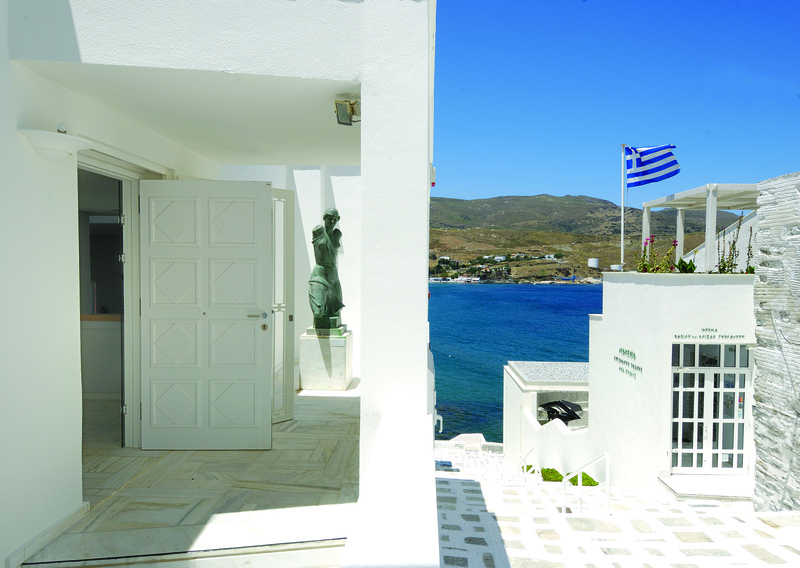 Frequented by moneyed Atheni-ans, Andros is discreetly affluent and largely unspoiled. The main town (another Chora) stands on a tiny car-free peninsular, its wide cobbled streets lined with Neoclassical mansions built by wealthy shipping families. On the east coast you’ll find several fantastic beaches, notably Ahla, an arc of fine white sand and pebbles that rings a deep turquoise bay, backed by plane trees and wetlands. It’s one of the most beautiful beaches in Greece and can only be reached via a bumpy 1.6-kilometer drive or by boat ride from Chora. Where to Stay: At the eco-conscious Onar (30-210/625-1052; onar-andros.gr; doubles from US$219), you can pick from 10 stone cottages that overlook Ahla Beach, each outfitted with open fireplaces and minimalistic furniture. 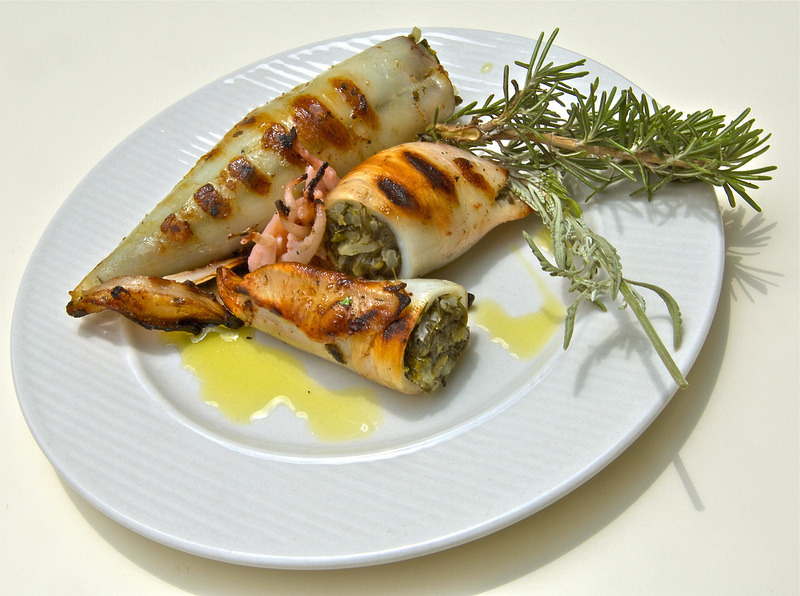 Meal Not to Miss: Freshly grilled fish on the terrace of the welcoming To Steki tou Andrea (30-22/ 8207-2070). Be Sure To: Visit the Museum of Contemporary Art (30-22/8202-2444; moca-andros.gr); this summer’s exhibition looks at the influence of Byzantine art on modern and contemporary Greek painters. The permanent collection includes works by Auguste Rodin, Alberto Giacometti, and Andy Warhol. The largest of the Cyclades, Naxos is the island for people who believe vacations are for exploring and staying active. 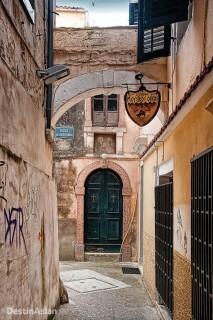 Its eponymous port town, a six-hour ferry ride or four- hour catamaran trip from Piraeus, is capped by the remains of 13th-century Venetian fort with a maze of winding alleys lined with un-pretentious restaurants, bars, and boutiques. The center of the island is rocky and mountainous, while the north is lush and fertile, and filled with silvery-green olive groves. For some of Greece’s best beaches, head to the west coast; Agios Prokopios, and clothing-optional Plaka are among the most picturesque strands. Where to Stay: Set amid gardens of roses and bougainvillea, Hotel Kavos (30-22/8502-3355; kavos-naxos.com; doubles from US$123) is a sprawling complex of suites, apartments, and villas overlooking Agios Prokopios Beach. Meal Not to Miss: The delicious kleftiko (oven-baked lamb) served in the cozy dining room at Lucullus (30-22/8502-2569; lucullus.gr), one of the oldest tavernas in Naxos Town. Be Sure To: Hire a quad-bike and head to the sleepy inland village of Halki for a taste kitro, a lemony liquor made from the leaves of citron trees. Local distillery Vallindra has been producing it since 1896. 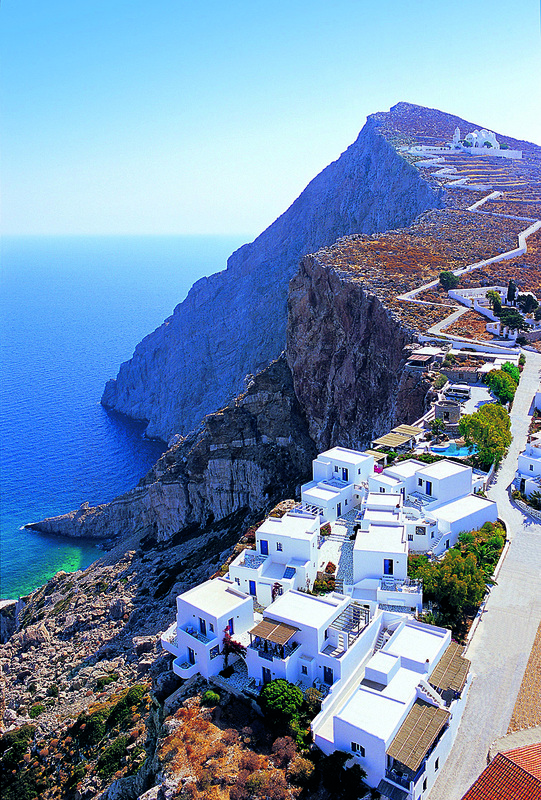 Tiny, remote, and rugged, Folegandros appeals to old-fashioned romantics and escapists. It has only three villages of any size and a population of less than 800 people, but it is up-and-coming with young cultured Athenians and in-the-know foreigners. From Piraeus, it takes seven hours by ferry (or half that time by catamaran) to reach Folegandros, but once you set eyes on the island’s beautiful main town, built on the edge of 200-meter cliff, you’ll know that’s time well spent. From here, a donkey path leads through sage- and thyme-scented hills to the island’s main cove, Angali. Farther on and served by water taxi, the smooth white stones of Livadaki Beach give onto an emerald bay. 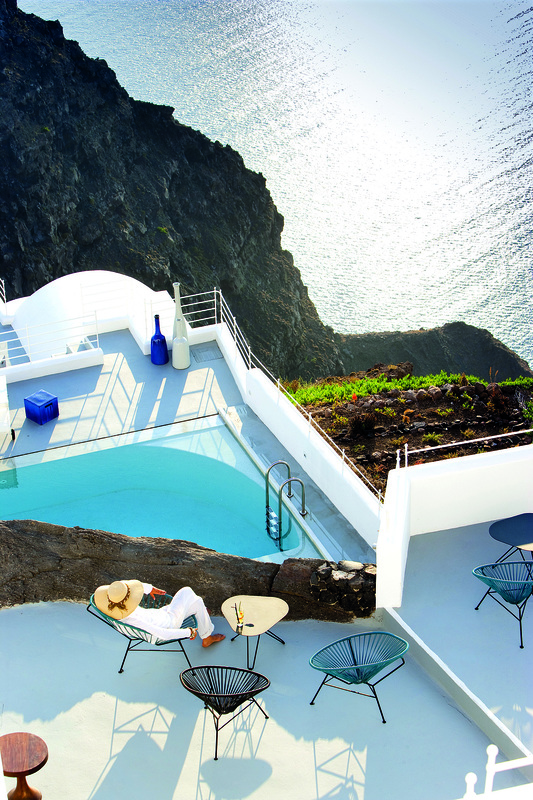 Where to Stay: The cliff-edge Anemomilos Apartments (30-22/8604-1309; anemomilosapartments.com; doubles from US$129), where comfortable self-catered studios feature stunning views down to the sea and the poolside bar makes a mean apricot daiquiri. Meal Not to Miss: The local pasta, matsata, served with a meaty tomato sauce at Piatsa (30-22/8604-1274), on Kontarini Square in Folegandros Town. Be Sure To: Take a boat trip around the island. Plenty of day cruises are on offer in the port of Karavostasis, with stops including Chryssospilia, a cave lined with ancient inscriptions.